This edition is based on the favourite novels of 9 librarians from universities and local libraries across the UK. The hand-typed book is based on a traditional library card – with each page highlighting a fragment of text taken from page 99. 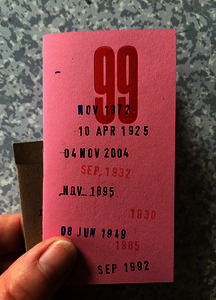 The cover is date stamped with the publication date of each novel.